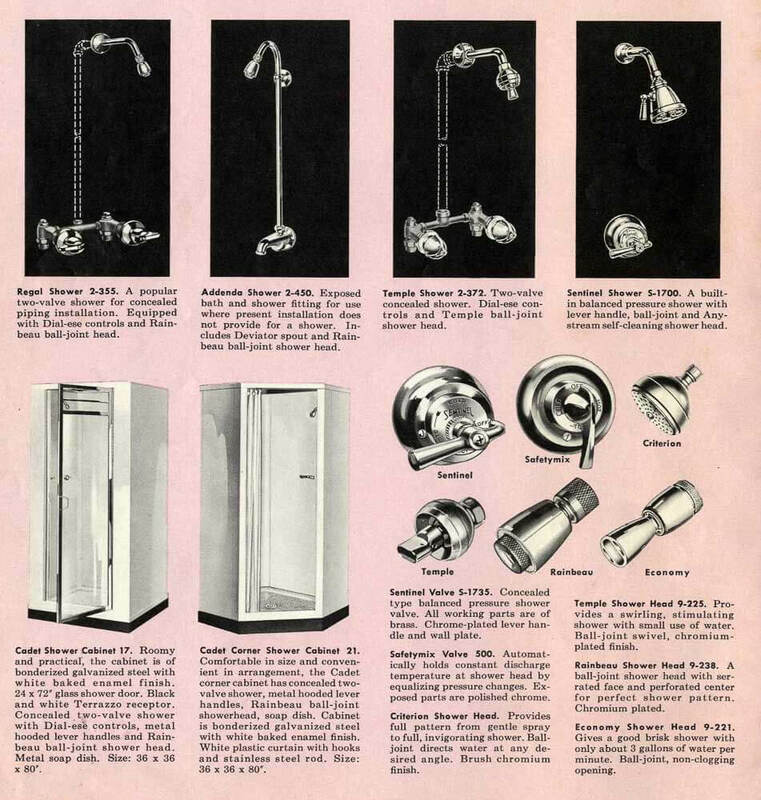 My stacks of vintage kitchen and bathroom brochures have been taunting me lately, so Ms. Scan I Am. This 1954 brochure from Crane is a beauty. Crane was top-of-the-line when it came to bathroom sinks, toilets and tubs. Gorgeous products! 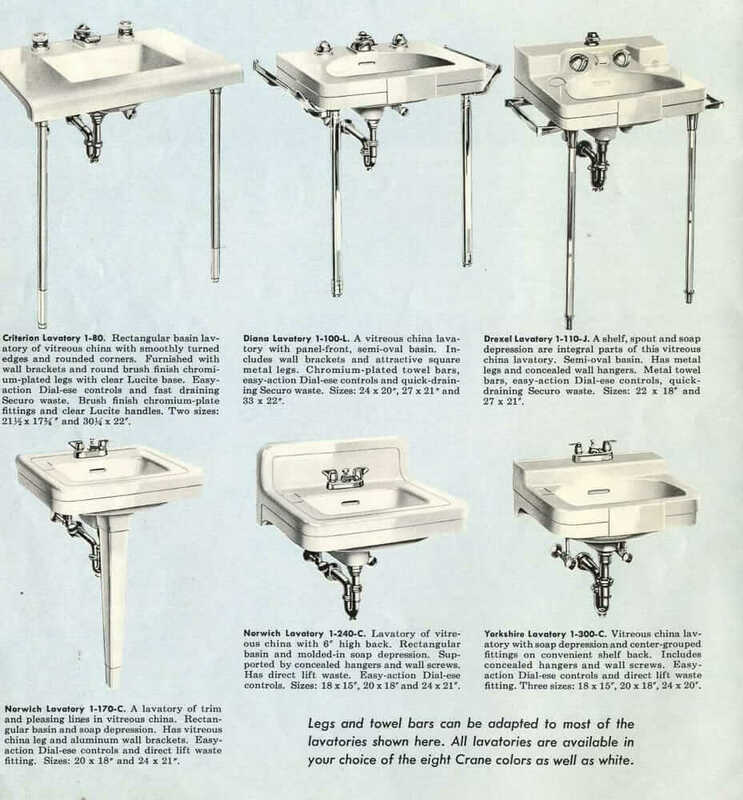 And, 1954 was an interesting year: America was just beginning to move into a new era of post-war styling, yet, with many of the same pre-war Streamline products. 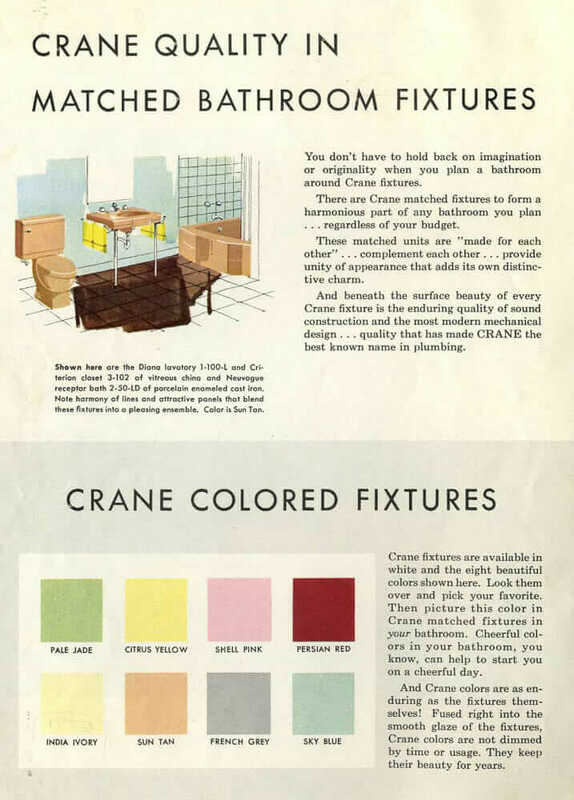 Because these brochures were meant to be aspirational eye candy, there were very very talented interior designers working on the mockup rooms: They were fearless in their experimentation with spacial organization, materials, colors, pattern, scale — it was all so modern. The genesis of this blog was my collecting materials like this and scrutizining every single detail so that I could consider how to replicate these looks in my own house. So today: Let’s scrutinize some of the most beautiful and highest quality bathrooms of … 1954. 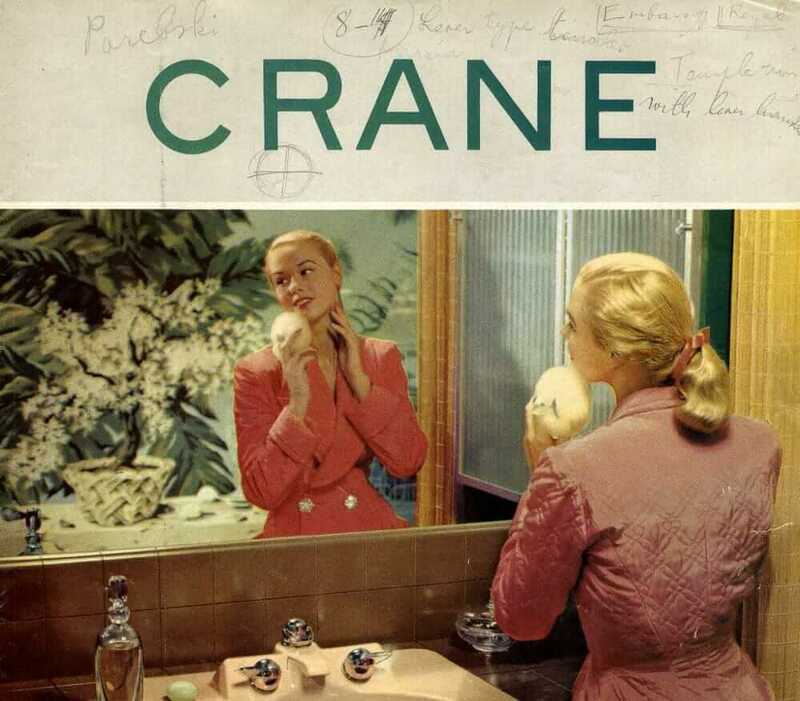 Above: We know it as a “Cinderella” bathtub, but in the Crane line, it’s the Neuvogue Receptor Bath. I love the color combination in this bathroom: Light blue, medium blue, coral and brown — warm, wonderful and today, unexpected. The catalog cover was targeted at the Mrs. 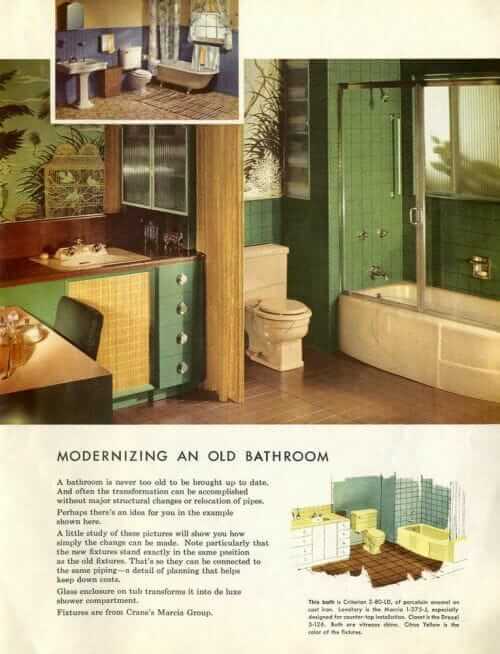 Note the tropical wallpaper. Has everyone noticed how palm leaf frond wallpaper is So Popular again today. I *think* they know it’s retro. The color palette in this one is very well done — while kind of “somber”, which keeps it pretty “neutral”, the designers added interest with materials, pattern and design. 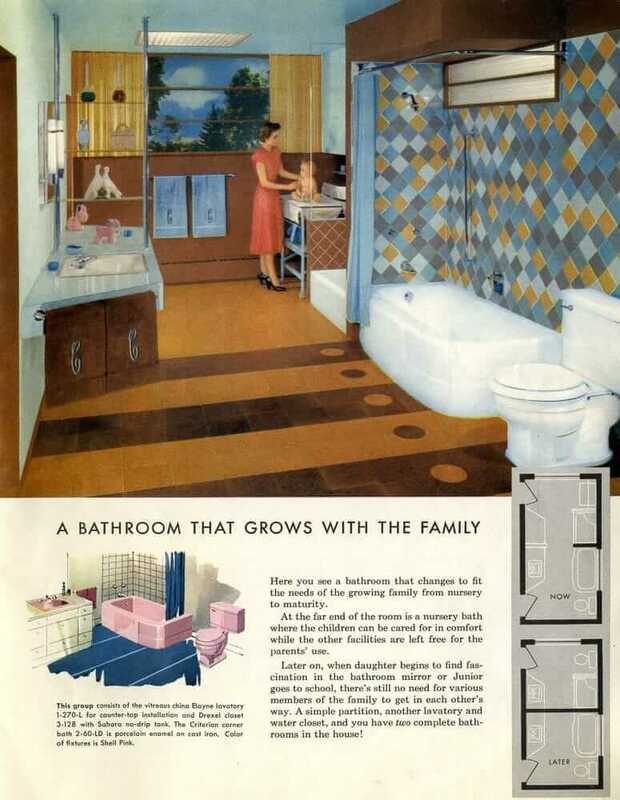 The color-values of the tile on the tub surround are particularly well done; the tile mix on the diagonal is pretty wild, but because the colors are toned down and used only around the tub, the overall effect does not “scream”. It’s milady-from-the-cover’s bathroom: A before and after! Again: Lovely colors. That green is one of the most timeless colors ever. 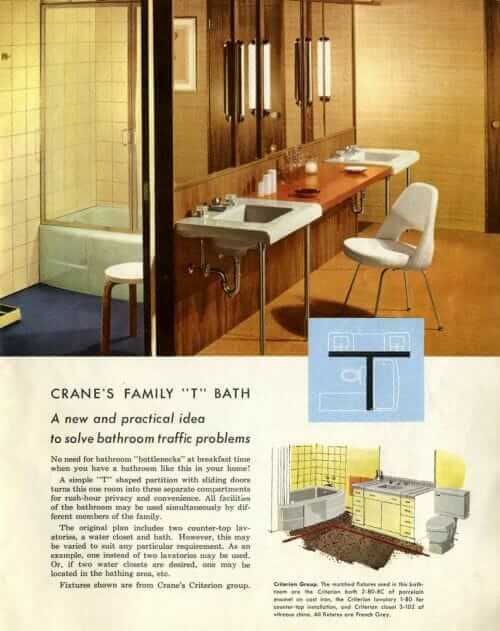 This bathroom is a harmony of neutrals, anchored by beautiful Crane French Gray fixtures. Note the mix of materials: Ceramic, glass, wood, cork, vinyl, grasscloth, laminate, chromium, boucle. 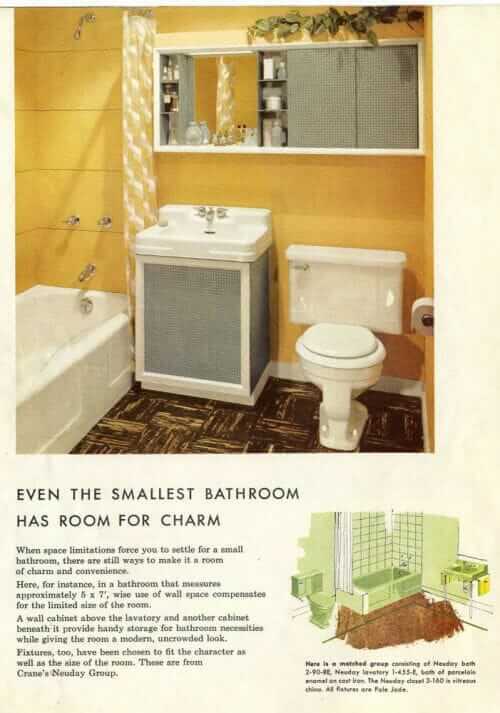 Above, indeed: “Even the Smallest Bathroom has Room for Charm.” Because, golly, this is how big most everyone’s house was, in 1954. 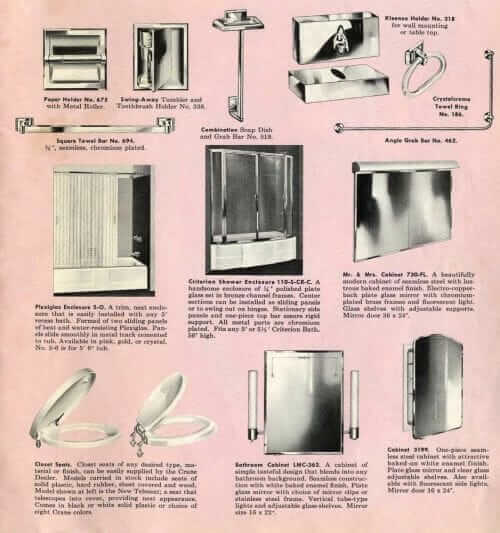 Interestingly, this brochure has no Mamie pink bathroom. 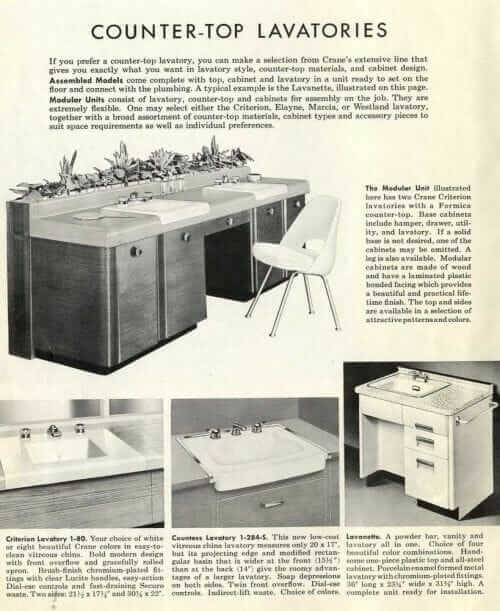 In ’54, Mamie madness was only really getting started; buckle up. 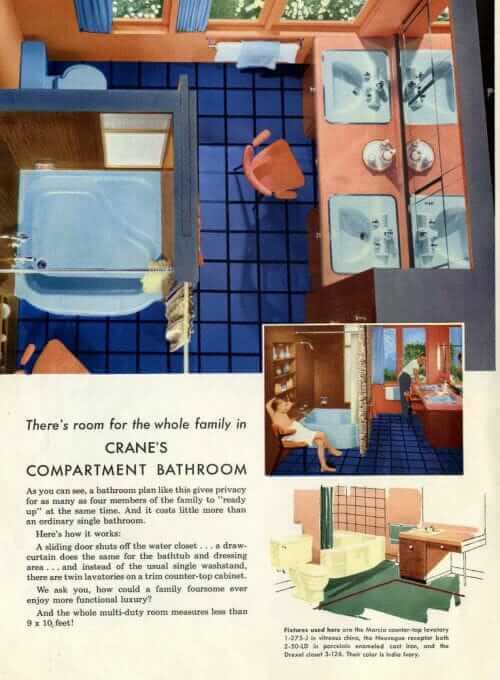 The Modular Unit illustrated here has two Crane Criterion lavatories with a Formica counter-top. 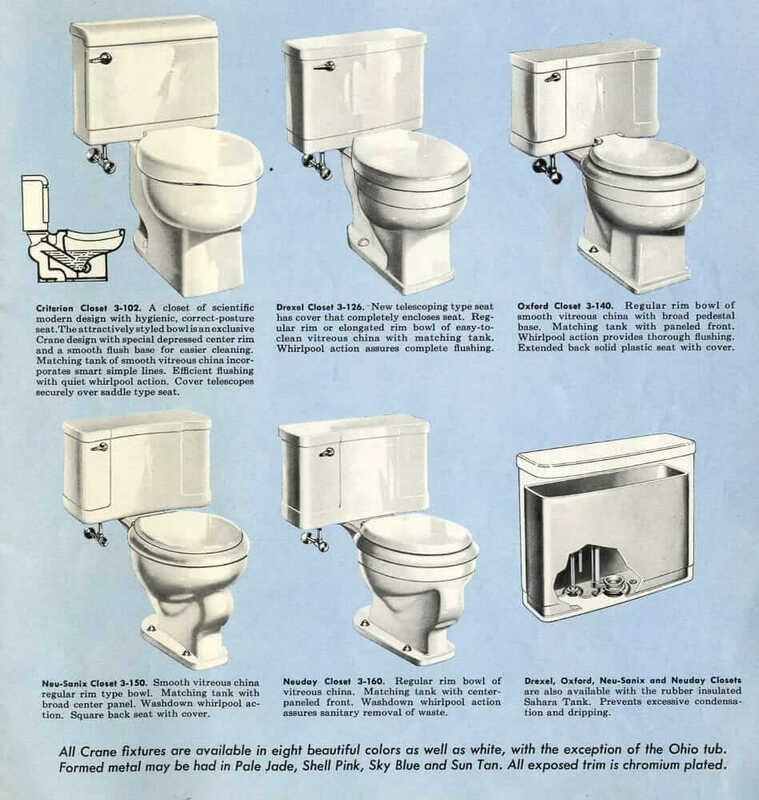 Base cabinets include hamper, drawer, utility, and lavatory…. Modular cabinets are made of wood and have a laminated plastic bonded facing which provides a beautiful and practical finish. The top and sides are available in a selection of attractive patterns and colors. 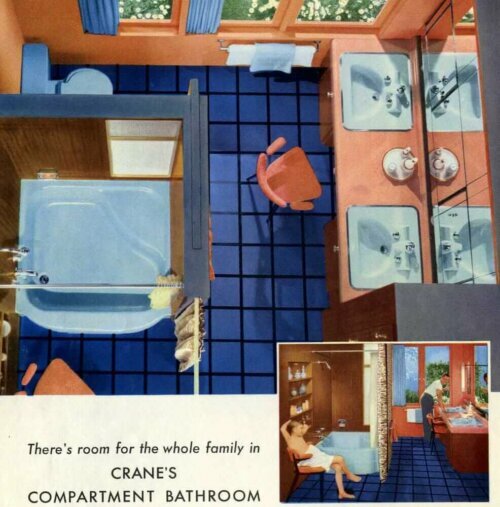 Above: Note they have a Swing-Away Tumbler and Toothbrush Holder. Surely this must have been made by Hall-Mack. But who knows! Thank you, Crane bathroom designers of 1954, for all the great ideas! You must have been mighty proud, and deservedly so. 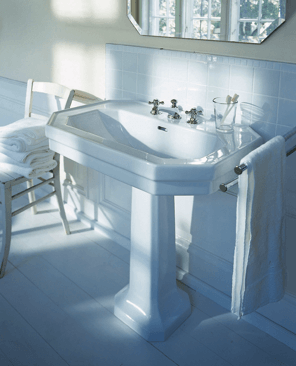 I have a Crane French grey Neuvogue Receptor Bath tub that has a chip in the porcelain by the drain spout, about 1/4”. Any ideas how to repair it? 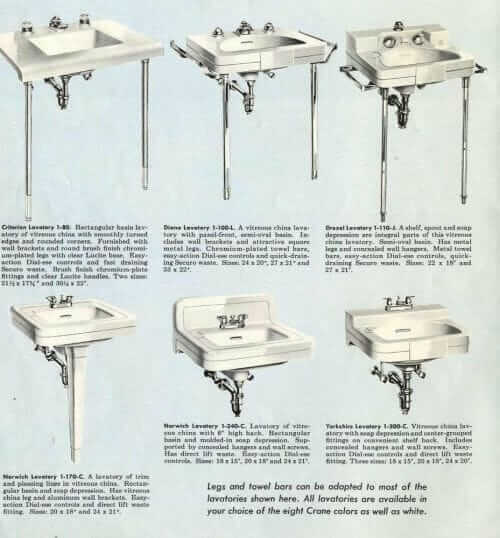 I have had to replace the Crane grey sinks and toilet with custom grey one ordered from Kohler. I love the grey fixtures. Wow! Great to see the catalog! 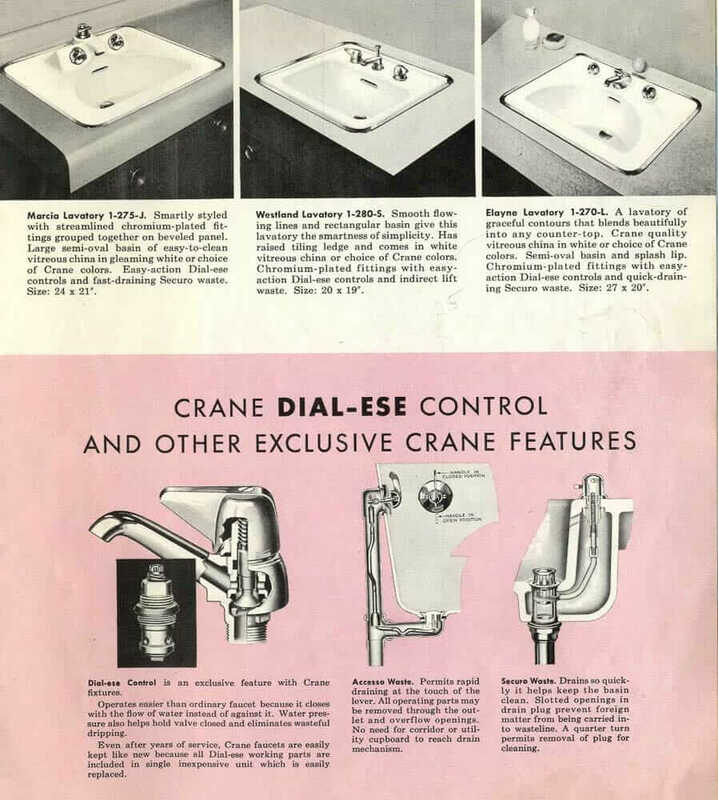 Our 1957 ranch in MA has so many of those great Crane features. 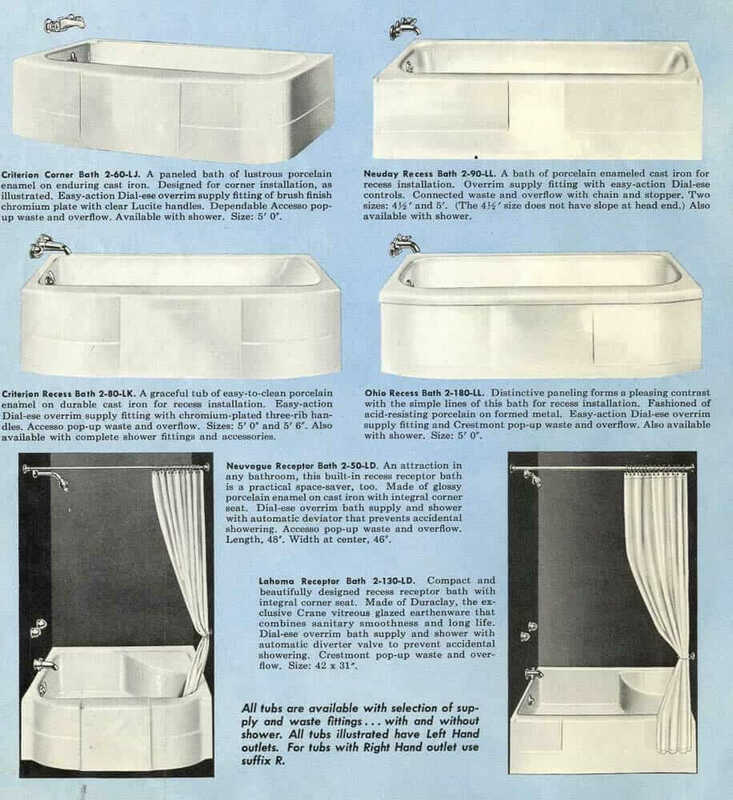 The grey Neuvogue bath tub in one, the Criterion sink and all matching fixtures in “Sun Tan” in another, and a bright yellow all matching fixtures in another. All three have “Conceal Away” compartments made by Marchand Inc, NYC for toothbrushes, tissues and toilet paper. One has an electrical outlet inside. I love that no one ever destroyed these beautiful things! Even the original tile is almost perfect. I wouldn’t change a thing! 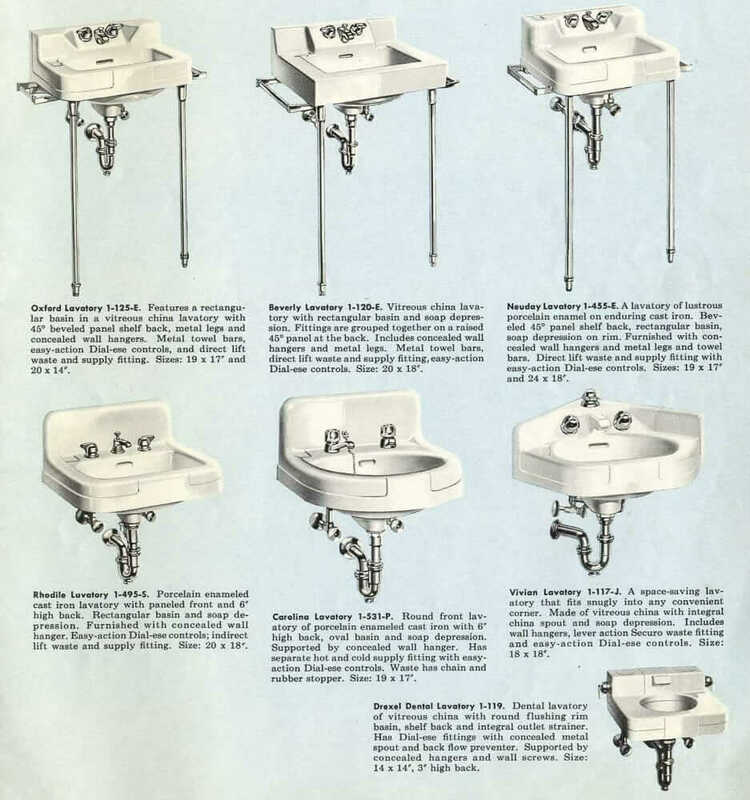 This is a marvelous overview of a wonderful catalogue! I love all the wonderful color possibilities, considering we don’t seem to have much color “adventure” in our souls these days – everyone seems to be so very concerned with being “safe” instead of individual and adventurous and bright and personal. 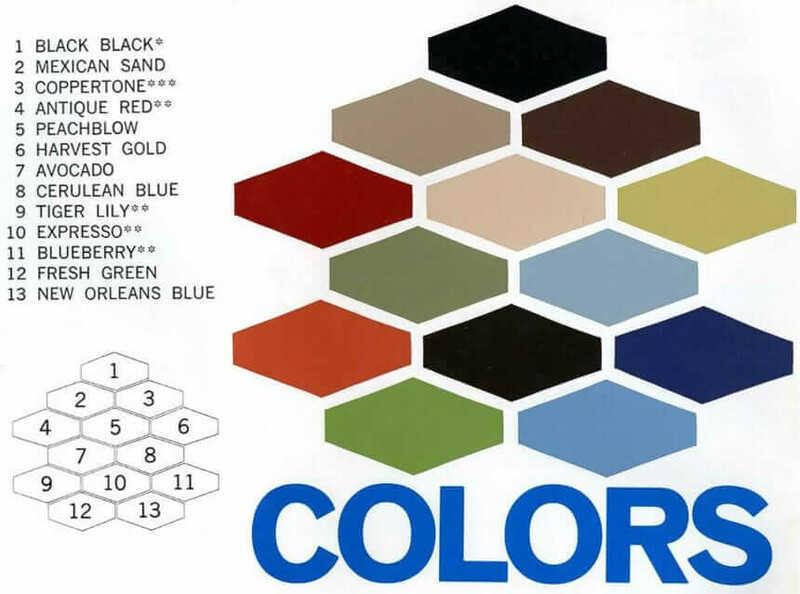 Pick out the colors that speak to your sense of beauty and style and design, and to your soul. Not just “blah” because you’re afraid that somebody else might criticize your taste! The possibilities here are almost endless. 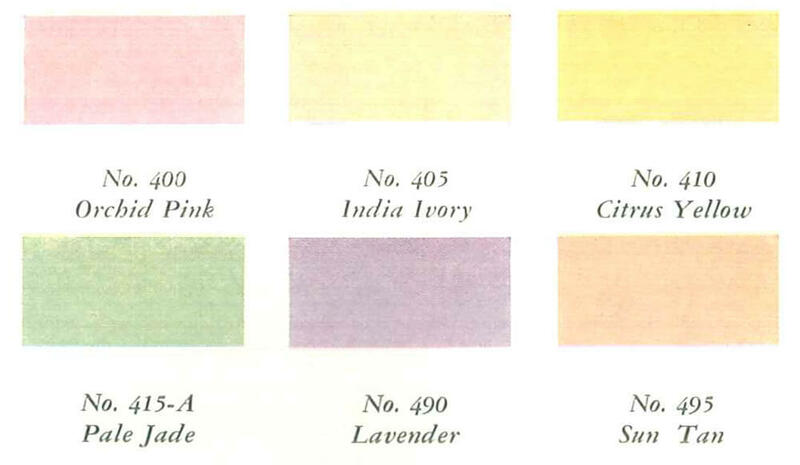 Especially with those neutrals and brights that can be put together to blend, the tan or the gray, along with the blue or the green, or that gorgeous red with gray together – I could have a field day running each of them together with the other, but in the separate compartments! I even asked my husband to read it, to make sure my little choo-choo hadn’t finally gone chugging round the bend, and he said it wasn’t me! 😣 I can’t make it out – what does it SAY? I’m just sure it’s some kind of processing error, but I surely can’t make it make a bit of sense. “The catalog cover was targeted at the Mrs. Note the tropical wallpaper. Has everyone noticed how palm leaf frond wallpaper is So Popular again today.